Delicious, handcrafted ice cream starts with natural, organic, and locally-sourced ingredients. It’s a little concept we like to call farm-to-frozen, and we know you’ll taste the difference. Since our shop’s humble beginnings in 2003, Barb Zapzalka has been churning out new, creative flavors as the season and inspiration strikes. In the retail shop, there are 20 rotating choices, both dairy and dairy-free, available for scooping and a freezer full of already packed to-go containers. All of our ice creams are made in the kitchen just behind our counter, its a small but mighty space! Committed to using the highest quality, fresh, and in-season ingredients, our delicious creativity — including dairy, dairy-free and sorbet flavors — has been featured both in Minnesota and nationally in places like Food & Wine, Thrillest, and Fodor's Travel. We're committed to using fresh (and often organic) ingredients from local farmers and makers. Whether it’s grain, milk or honey, you can count on us sourcing every ingredient we can from local partners. Meet our crew. Family-owned and operated by Pat and Sharlene Daninger..From grass to glass(they glass bottle their dairy), you won't find fresher milk anywhere They use a rotational grazing system that keeps the cows outside in their natural habitat. The entire farm is managed in a highly sustainable and environmentally balanced manner.. Using the heritage/heirloom organic grains that is very different from todays modern wheat and some people find it to be better to digest. Heritage Breads makes our cookies for our ice cream sandwiches as well as lemon bars and really any of our baked goodies! A little gem in Northeast Minneapolis. This local team supplies us with fresh, roasted-to-order nuts like pecans and almonds. Because nothing goes better with something sweet than something salty. A collection of small farms across Minnesota. We get locally-grown organic fruit from the network, a rainbow of color, including: strawberries, blackberries, grapes, and raspberries. Wolf Honey Farm honey is gathered from fields of clover and wild flowers of the St. Croix Valley and sold at the St. Paul’s Farmers Market. We use honey in seasonal flavors like Buckwheat Honey. Certified organic heirloom Turkey Red flour is used in our homemade waffle cones brought to you by Darrold and Marty of Sunrise Flour Mill. Heirloom wheat is very different from todays modern wheat and some people find it to be better to digest. We are proud to offer the healthiest heirloom organic grains we can find. A true family farm, it's been passed down for generations. It's now run by Larry, his wife Cindy, and their five kids. 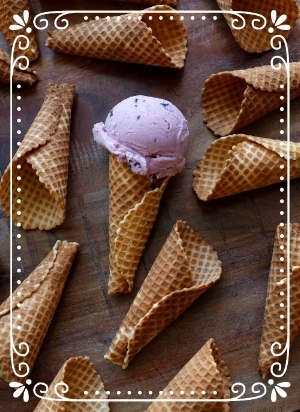 They supply our free-range, cage-free, certified organic eggs used in our homemade waffle cones.